Each year, we New Englanders button down, bundle up and put our summer "toys" away. 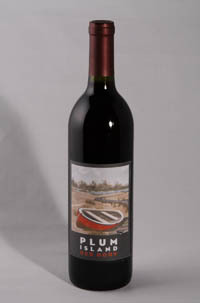 Plum Island Red Dory celebrates the season that lies ahead. This wine blend is slightly sweet, with aromas of plums and blackberries finishing with a kick of velvet spice. Red Dory pairs well with football, progressive dinners, bonfires and holiday parties. Ship this wine to MA, NH, CA, FL, MN, AK & DC!